Come diffondere in giovani e adolescenti comportamenti sani riguardo all’uso di droga, e come migliorare la capacità dei docenti di scuola secondaria nell’individuare e prevenire l’abuso di sostanze stupefacenti? Since prehistoric times people have turned to drugs to lessen physical pain or alter their state of consciousness. Drug use was generally limited to people who had reached maturity or very particular situations. Currently, drug use and abuse is a very serious social and public health problem that generates great social concern. This is due to the widespread drug consumption in many sectors of the population, the decline in the age of usage initiation and the severity of the individual and community consequences of the phenomenon on the three levels considered in the current concept of health: physical, psychological and social. If a few years ago, speaking of the drug problem usually alluded to illegal drugs such as heroin, currently the concern has focused on the consumption of legal drugs such as alcohol and tobacco, which are considered the gateway to the consumption of other substances. Alcohol and tobacco are also considered the gateway to the use of substances whose consumption is increasing, cannabis and cocaine. The phenomenon of drug use among young people is a growing problem which needs to be addressed in an international and multidisciplinary way. According to the epidemiological studies, the number of youngsters who admit having tried drugs continues to grow, while the starting age is decreasing (European Monitoring Center for Drugs and Drug-Addiction Annual Report 2007). Know the state of the art in preventive intervention and early detection of drug use in school environments in the participating countries. 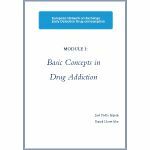 To avoid duplicating effort, results of convergent projects will be taken into account, such as the one developed by the European Monitoring Centre for Drugs and Drug Addiction (EMCDDA), which is currently being developed in participating countries. To accomplish this objective, we established a systematic methodology to compile programs and best intervention practices for drug dependency in school environments. Create and/or validate an instrument for early detection to identify youngsters vulnerable to drug use and develop suitable selective prevention measures. This objective intends to provide the beneficiary group, high-school teachers, with an instrument capable of detecting high risk individuals before they start using drugs, as well as detection and early treatment those who already use drugs. This instrument is to be used by professionals in secondary education as a practical and innovative part of their training program. Starting from the need to prioritize the implementation of measures directed at improving the efficiency of preventive detection and intervention, reporting risk factors related to drug use to contribute to early intervention programs, and guarantee training for professionals who are in contact with potential drug users, especially young ones. The course focuses on drug use prevention. Secondary school teachers are the main target. The main goal of the course is to help secondary school teachers to prevent and detect drug consumption among their students.